11 December marks the anniversary of the death of Sir Roger l’Estrange, a journalist, pamphleteer and author, in 1704. Born in 1616, l’Estrange was a strong defender of royalist claims and political controversy followed his every move. He was also a translator of classical Greek and Latin texts and is famous for his translations of Aesop, published as Fables of Aesop and other eminent mythologists with morals and reflexions (1692) and its follow-up, Fables and Storyes Moralized (1699). Selections of his translations were still in print in the 20th century. More pictures relating to Aesop and his fables can be found here. Many more illustrations featuring fairy tales and fables can be found at the Look and Learn picture library. 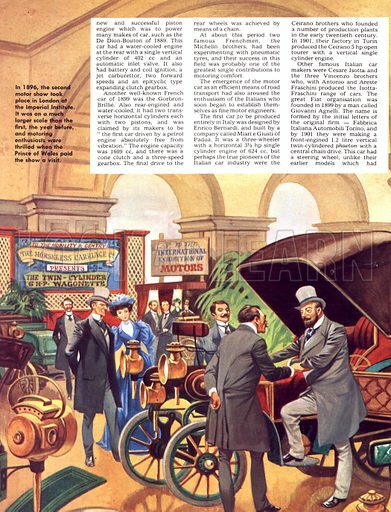 11 December marks the anniversary of the first ever motor show, which opened in Paris, France, on this day in 1894. The first British motor show followed in 1895 with six cars being exhibited in Tunbridge Wells. 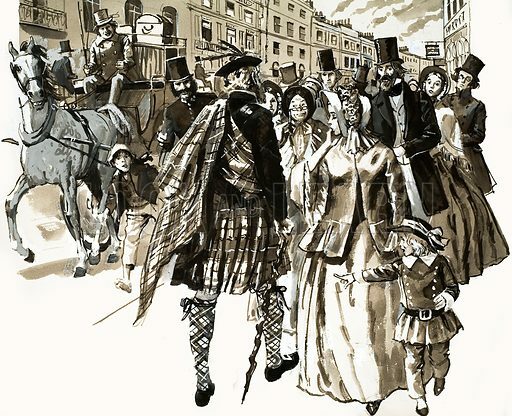 The second show in Britain was a much grander affair held at the Imperial Institute in London and visitors were thrilled to see the Prince of Wales when he paid the show a visit (pictured above). Many more pictures relating to the history of the motor car and driving can be found at the Look and Learn picture library. 10 December marks the anniversary of the birth of author George MacDonald in 1824. Born in Huntly, Scotland, MacDonald studied at Aberdeen University and then attended Highbury College, training for the Congregational ministry. He became a pastor but left through ill health, eventually settling in London as a teacher and editor. His books include the fantasies Phantasies, The Princess and the Goblin, At the Back of the North Wind and Lilith. “I write not for children,” he said, “but for the child-like, whether they be of five, or fifty, or seventy-five.” MacDonald was the mentor of Lewis Carroll (Charles Lutwidge Dodgson) and convinced him to submit his book about Alice’s adventures in Wonderland for publication. He also influenced C. S. Lewis (who featured him as a character in one of his books) and J. R. R. Tolkien. Although Macdonald died in 1905, aged 80, many of his books are still in print. Many more pictures relating to authors and their works can be found at the Look and Learn picture library. 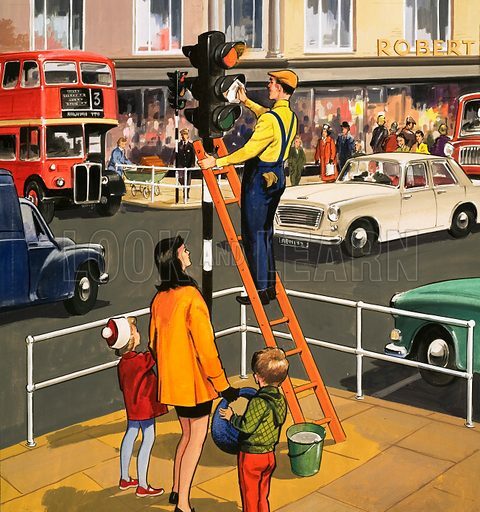 10 December marks the anniversary of the erection of the first traffic lights in Westminster, London, in 1868. The original traffic light was placed outside the Houses of Parliament by railway engineer J. P. Knight and resembled one of the era’s railway signals, with semaphore arms and red and green gas lamps for use at night. 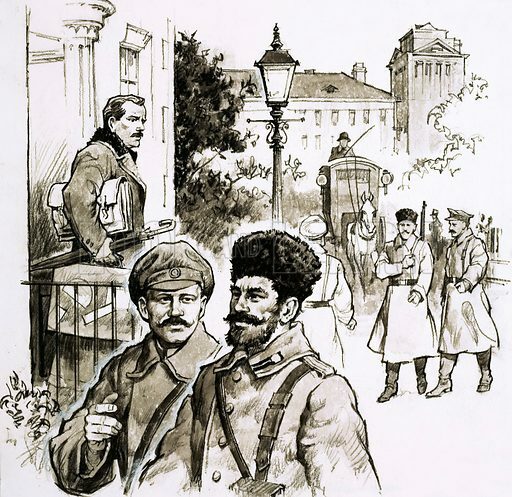 The gas lantern was turned via a lever at its base so that the appropriate light faced traffic. Unfortunately, it exploded on 2 January 1869 injuring the policeman operating it. The modern traffic light has three lights, red, amber and green. Many more pictures relating to the history of transport can be found at the Look and Learn picture library. 9 December marks the anniversary of the birth of poet John Milton in 1608. Born in Cheapside, London, Milton was privately tutored and attended Christ’s College, Cambridge where his delicate looks and long hair earned him the nickname ‘the Lady of Christ’s’. After travelling in Europe, he became a private schoolmaster and regularly published tracts and pamphlets on education and politics. 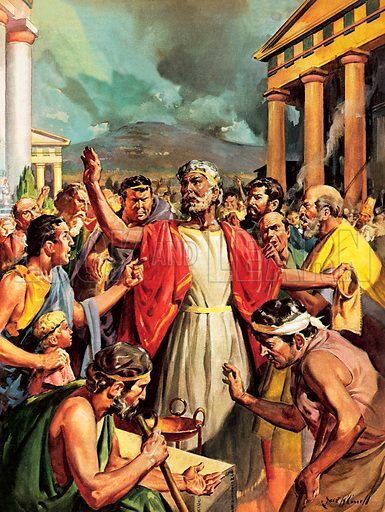 During the Restoration, he went into hiding and his writings were burnt, although he was later pardoned. Milton published very little poetry but one, Paradise Lost (1667), and its sequel Paradise Regained (1671), have stood the test of time. The first concerns the expulsion of Adam and Eve from the Garden of Eden, the latter with the temptations of Christ. Milton died only a few years later, in 1674, at the age of 65. Many more picture relating to the life and works of John Milton can be found at the Look and Learn picture library. 9 December marks the anniversary of the first performance of Richard Strauss’s opera Salome in Dresden in 1905. The German composer, perhaps best known for his orchestral piece Thus Spake Zarathustra, based his opera on the play by Oscar Wilde. Its most famous scene is the Dance of the Seven Veils. The origins of the story of Salome are in the Bible. 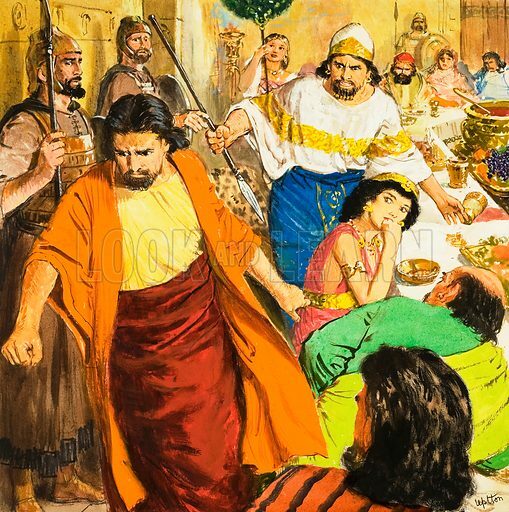 She was the stepdaughter of Herod who was so pleased with her dance that he promised to give her anything she asked for. Salome, with the encouragement of her mother, Herodias, asked for the head of John the Baptist and it was delivered to her on a plate. 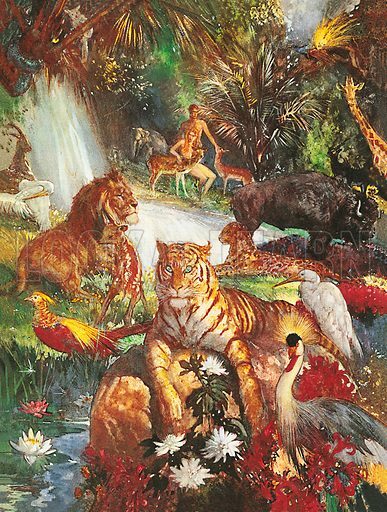 Many more pictures relating to the Bible, both Old and New Testaments, can be found at the Look and Learn picture library. 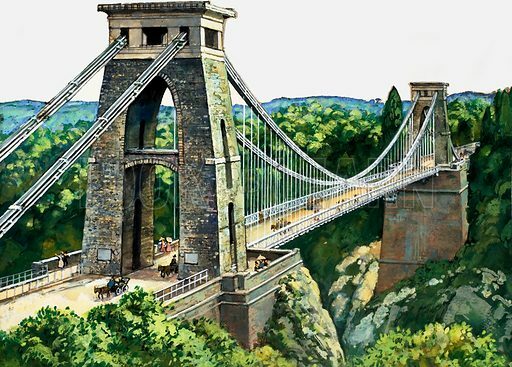 8 December marks the anniversary of the opening of Clifton Suspension Bridge in 1864. This magnificent bridge had a rocky history leading up to its opening. William Vick, a merchant from Bristol, left a bequest of £1,000 in his will in 1753 stipulating that once interest on that amount reached £10,000, it was to be used to build a stone bridge across the Avon. Although funds accrued, they were far short of the cost of a stone bridge. Instead, the government invited designs for an iron bridge in 1823. Thomas Telford claimed that no suspension bridge could be build longer than the 577 feet of his Menai Suspension Bridge and rejected all designs. A second competition attracted Isambard Kingdom Brunel and work based on his design began in 1831. Work being suspended during the Bristol Riots and not begun again until 1836. By 1843, with the towers built, funds ran out and the ironwork was sold to build the Royal Albert Bridge. New funds were raised following Brunel’s death and, Using chains from the Hungerford suspension bridge across the Thames, which was demolished to make way for a new railway bridge, work began again in 1862 and completed two years later. Many more pictures of bridges from around the world and throughout history can be found at the Look and Learn picture library. 8 December marks the anniversary of the composer Jean Julius Christian Sibelius in 1865. Born in Finland and known as Janne to his parents, he later took to using the French form Jean by which name he is universally known. As well as seven symphonies, his best known compositions include the symphonic poem Finlandia, the waltz Valse Triste, Violin Concerto in D Minor, and his adaptation of The Swan of Tuonela from Finnish mythology. Sibelius remains a popular figure in Finland, his portrait appearing on the 100 mark bill. Many more images relating to composers and their compositions can be found at the Look and Learn picture library. 7 December marks the anniversary of the Japanese attack on Pearl Harbour in 1941, bringing America into the Second World War. 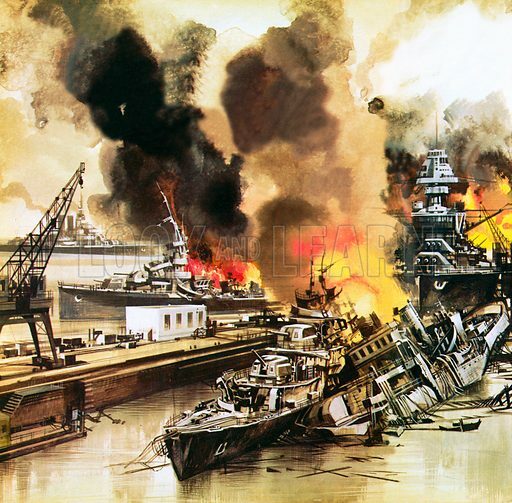 The harbour on the island of O’ahu, Hawaii, was attacked in the early hours of a Sunday morning by waves of Japanese bombers and fighters, sinking nine ships and severely damagine another 21. The death toll was 2,350, 68 of them civilians, and 1,178 injured. The Japanese lost 29 of the 350 aircraft used in the attack. More pictures relating to the attack on Pearl Harbour can be found here. Many more illustrations relating to World War II can be found at the Look and Learn picture library. 7 December marks the anniversary of the opening of the Royal Opera House in Covent Garden, London, in 1732. Originally called the Theatre Royal, the original building was destroyed twice – in 1808 and 1857 – by fires. The theatre was rebuilt in 1858 and remains one of the major venues for performing arts in the world. 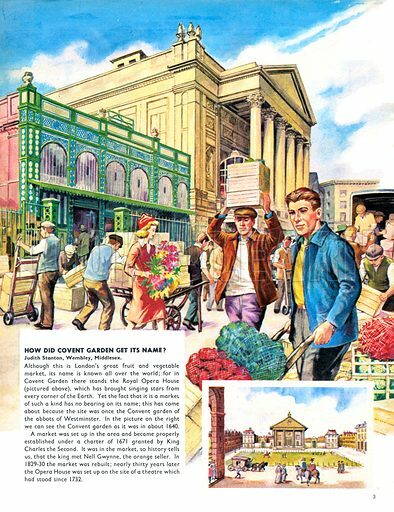 Our illustration asks “How did Covent Garden get its name?” The site was once the garden of the abbots of Westminster. A market was set up by charter in 1671 near the convent garden and rebuilt in 1829-30. More pictures featuring the Royal Opera House can be found here. Many more illustrations relating to the history of theatre can be found at the Look and Learn picture library.